So you have a Blogger Blog in English and your major reader base includes Hindi speaking audience. Here is an add on tip to facilitate your esteemed readers. Give your readers, both the options to comment in English or Hindi. It is very easy to implement in aÃ‚Â blogger blog. 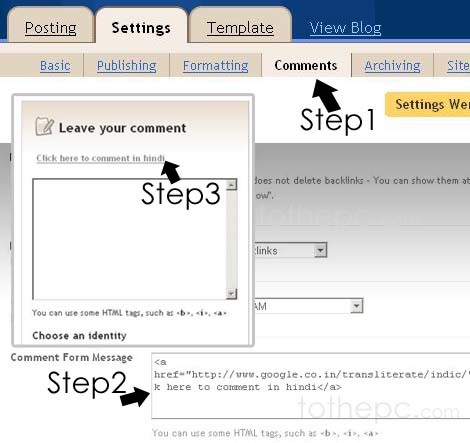 Step1: In Blogger: Click on Comments, Click on settings. I will suggest to use new window code, so that reader can easily copy the Hindi text from translator and paste in the comment form. You can also customize the Link text by editing ‘Click here to comment in hindi’. Step3: This procedure only involve 2 steps, this step is basically to show the result. Check the photo to see how link will appear toÃ‚Â you blogÃ‚Â reader. Above procedure is only applicableÃ‚Â to Blogger Beta(new) blogs. If you run old blogger, not to worry, you can easily embed the Hindi translator within your blog, get the code here. Learn more for blogging in hindi at blogger here. Hope this will be useful to all the blogger users out there. Traditionally I have loved blogger. With new features being added, it is certainly getting better. Happy blogging! this code is showing some error.